Habit: Evolvulus alsinoides grows as a lax perennial herb to 25 cm in height. The leaves are arranged alternately, oblong/elliptical, to 3 cm long and 0.5 cm wide with an entire margin, an acute leaf apex and leaf base. Leaves and stems covered with pubescent trichomes. The complete, perfect, actinomorphic flowers are solitary in leaf axils. The calyx has 5 unfused, green sepals. The funnelform corolla has 5 fused, pubescent, purplish blue to white petals. There are 5 functional stamens fused to the base of the corolla and 5 staminodes. The superior ovary with 2 locules and numerous ovules. The round fruit is a tan, many seeded capsule with glabrous seeds. 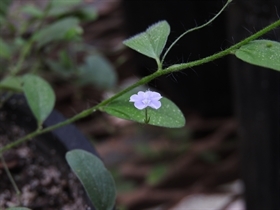 Habitat: Evolvulus alsinoides grows in exposed rocky soil and human disturbed areas. Distribution in Bahamas/Globally: Evolvulus alsinoides occurs throughout the Bahamian Archipelago and is pantropical in distribution. Medicinal/Cultural/Economic Usage: Evolvulus alsinoides is not used medicinally in the Bahamian Archipelago. It has been used medicinally in the Far East particularly in India for a variety of ailments.